Where does. time go? It’s certainly been flying. We’re in the middle of September and only have a few weeks left in the Pacific Northwest. Daytime temperatures have been beautiful but those night time temperatures remind us that fall is closing in. RVing friends, Tina and Jeff, have been in the area and it’s been fun catching up with them. The last time we connected was in Florida. Friday night we sampled great brisket at Famous Dave's in Portland. On Sunday we stopped by our place, checked out the Kamp Kitchen, our lake and Tina even had a chance to hand feed a couple deer. We also visited a nearby grist mill and a covered bridge. We had hoped to take them to the US Grant House for lunch but the buildings in the historical section of town aren't open on Sunday. 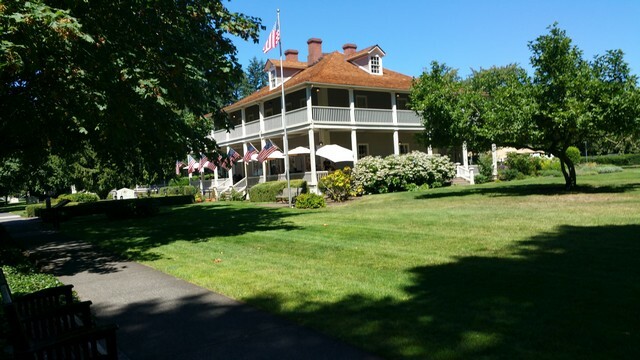 We just drove by the reconstructed Fort Vancouver, the Vancouver Barracks and the Historical Officer’s Row. After that, we headed to a waterfront restaurant. It was a warm day and we were lucky enough to get patio seating. There weren't a lot of boats out but there were a few. Our table was perfect to enjoy the view of the water and the boats. Our timing was also perfect because the I5 bridge raised for a sailboat. The best part of that was that we weren't in the traffic waiting for the bridge to be lowered. Our South Dakota Titling saga still isn’t over. So far we have spent $90 on mailing the trailer title documents back and forth. We had hoped to eliminate any penalties due to lag time in getting the title transferred. I’m still not sure if we’ll be successful or not. The title was returned to us by the state and after another 60 mile return trip to the dealer, he finally came up with a form that might work. It’s actually an odometer statement for vehicles but it just might be what South Dakota wants since it says “reassignment” on it. We’ll find out today if we can finally get the Teepee titled and licensed. We’ll also find out if we have to pay a penalty. If they don’t accept the form, we do have options. Our niece has volunteered to have it titled in her name in Oregon until we can transfer it as has a neighbor and our daughter can do it in Washington. So, we’re not really out on a limb …. thank goodness for that! Tammi and I spent Saturday at a BBQ Grilling and Smoking class. I think we walked away with a lot of knowledge. In addition, we had fun and also got to taste a lot of food. We ended up learning different methods to grill meats and vegetables. Now I’m anxious to try some of the new techniques on my own Traeger. Then, that evening there was a surprise birthday party for me. No. It’s not really my birthday. My birthday is at Thanksgiving time and we are almost always enjoying warmer weather in the south then. This year I’ve made plenty of comments to the kids about how I never get a party and everyone else does …. so the surprise. However, what they don’t know is that we may be here for Thanksgiving this year …. maybe. Does that mean I get another party? I think I should to make up for last year. Don’t you? This week is a busy birthday week. We're celebrating Terry's on Thursday at Red Lobster, Robert's on Saturday with a barbecue and Sabrina's on Sunday at Lake Sacajawea. It'll be busy (and fattening) for sure ! Day time temperatures may have been in the mid-80’s but those cool nights have got us thinking about our snowbird plans for winter. Next month we’ll work our way towards Page, Arizona. We’ve never been there but visiting Antelope Canyon and Lake Powell has been on my bucket list for sometime. Last year at this time we were all booked up. That’s necessary for Florida but not so much for Arizona. We are hoping for a little time in Sedona, Tucson, Borrego Springs and, of course, San Diego. We will see how that works when we actually get ready to move. Hey, I'm learning a lot about BBQing just from looking at the pictures. Butternut squash on the grill. Yum. Good seeing Jeff and Tina. I'll say you have been busy! What awesome times with friends and family. Love the pictures from the BBQ class. Gives me lots of ideas. Well a birthday party anytime is always goo and looks like some busy times for you as always. Amazing what you can do on a BBQ and as you know we love ours. Hope we can catch up with you this winter again. DMVs are one entity that are terrible no matter what state you go to. I think it's the one place that miserable, unfriendly and nasty people can get a job. PS: Happy early 29th Birthday! Our former neighbors celebrated half birthdays for those whose birthdays didn't fall at good times of the year. Oh good I'm glad you got some lessons in that means you'll be cooking for us right!?? You're starting to plan winter travels and we're starting to make our six month doctor appointments. lol Food looks so good- sure am glad I already had lunch. Definitely need two birthday parties. More is better. You'll love Page. There's also Slot Canyon, Horseshoe bend and the dam. Good grief...how long can this title issue go on!!! Looks like you had a feast at that class...yummy. Those raising bridges are so cool in action! Our favorite day trip while in Page was Vermillion Cliffs - absolutely spectacular. Looks like the class was great! !